SINN FÉIN COUNCILLOR Chris Andrews has said he will withdraw his motion to name a set of new benches at Ranelagh’s Triangle after 1916 leaders, after speaking to the family of Deirdre Kelly, the woman to whom a tribute is already on site there. Dublin city councillors were at odds over the motion set to be discussed at tomorrow’s council meeting that would commemorate a number of 1916 leaders at the Triangle in Ranelagh. The motion called for the names of these leaders to “be placed on the three new granite bench seats being placed in position at the triangle in Ranelagh village”. Kelly’s family had even set up a petition this morning to try to block the move, and it has gained over 250 signatures since this morning. Sinn Féin’s Chris Andrews was initially in favour of the proposal, saying that it would recognise the “strong connection” that the likes of Padraig Pearse, Con Colbert and Thomas MacDonagh have to the area. Labour’s Mary Freehill, on the other hand, said that there is already a permanent memorial to local environmentalist and author Deirdre Kelly on the site and that adding further plaques would “dilute her contribution to the people of Ranelagh”. Kelly, who died in 2000, fought hard against office development and road-widening schemes in communities across Dublin city, and was an advocate for cycle lanes and better public transport. Her book Four Roads to Dublin, published in 1995, presents a history of Ranelagh, Rathmines and Leeson Street. Speaking to TheJournal.ie yesterday, Kelly’s daughter Maeve said that she was shocked to see the proposals. She said: “It really is a personal tribute to our mother. There are very few monuments to women around. My mother was a very special woman who was well-loved in the area. She fought for people who couldn’t fight for themselves. It was very touching that Dublin City Council would erect a monument to her, considering she was such a thorn in their side most of her life. While she doesn’t object to any kind of tribute to Pearse et al closer to the school he did set up in Ranelagh, Maeve Kelly said that putting them in the same spot would dilute the tribute to her mother. “It means a lot to us,” she said. 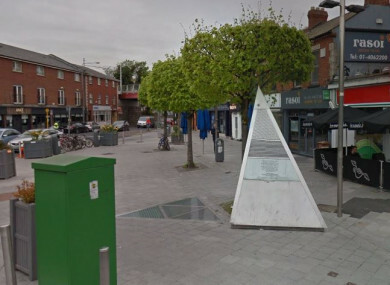 Freehill, meanwhile, told TheJournal.ie that the tribute in Ranelagh to Kelly has recently been refurbished and to try to take away from that would be “unfair and inappropriate”. “I’ve spoken to a lot of people in Ranelagh who are very annoyed about the proposal,” she said. It is a rare occasion that a woman’s work is recognised… by dedicating these small benches to different people dilutes her contribution to the people of Ranelagh. Andrews, on the other hand, told TheJournal.ie that this proposal would in no way take away from the tribute to Kelly or recognising her achievements. Padraig Pearse, Willie Pearse, Con Colbert and MacDonagh all taught at St Enda’s School in Ranelagh, which was founded by Padraig Pearse. All four men were shot dead in Kilmainham Gaol after the 1916 Easter Rising. “The triangle is such a nice place, and it can be a very social place during the summer,” Andrews said. “These men have this connection with Ranelagh, and it’d be a shame not to acknowledge it. I’m disappointed that there’s opposition [to the motion]. No one is trying to take anything away from anyone else. I think it’s really important to acknowledge that as well. After speaking to the Kelly family, however, Andrews said that he had agreed to withdraw the motion with a view to finding a different location locally that would acknowledge the men in some way. Maeve Kelly told TheJournal.ie that Andrews was respectful towards their concerns, and kindly agreed to drop the motion. Email “Sinn Féin councillor drops plan for 1916 tribute at Ranelagh Triangle after opposition”. Feedback on “Sinn Féin councillor drops plan for 1916 tribute at Ranelagh Triangle after opposition”.